Remember that scene in Cool Runnings when they arrive in Calgary and Sanka rushes back into the terminal to put on everything in his bag, followed by the bag? Thirteen years ago, that would have been me arriving in New Zealand, had my grandmother not met us at the airport with a better bag: a bag full of woollies, knitted with her own two hands. That bag included a grass-green guernsey for me, a garment which I immediately put on and have worn for large parts of every year since. When it was two years old, I wore it to said grandmother’s funeral, along with some of my similarly guernseyed cousins (she was a very productive woman, my gran). I have done many wardrobe clear-outs over the years, of varying levels of drasticitude, but I have never considered getting rid of my guernsey. So you can imagine my distress on noticing that the cuff was wearing thin at the fold. But we were in the middle of moving house, packing everything up and so on; hardly a good time to settle down to some mending. I did manage to go through the box of ancestral happiness which contained all the odds and ends of wool left behind by this same knitting grandmother, looking for matching wool to mend with. Alas, there was not so much as a scrap of the original yarn, but I pulled out a few greens and packed them separately, so as to have them to hand. Imagine my horror, on one of our first mornings in this house, when I pulled the guernsey on and my finger went through a hole. This is what our camera thinks grass-green looks like. There was no time to be lost. I found the assortment of green yarns and compared them with the original to decide which was closest. There was one that was Close Enough to Do, I decided; no need to hit the shops before a mend could be undertaken. The next question was one of method. It may be “sleep that knits up the raveled sleave of care,” but for raveled sleave of guernsey you need some kind of a darn. Results having finally come through (or rather worn through) from the sock-darning experiment, I thought I would go with the classic back-and-forth darn. One of my vintage handwork books recommends a sort of Swiss darning for holes in knitted things (there’s a tutorial here if you dare), but I quailed at the thought. I was by no means sure of my ability to execute it correctly – and the idea of taking scissors to the beloved garment brought me out in a cold sweat. This was no mere sock, after all. This was the last garment my gran ever made for me, and while there may be knitting where she has gone (I sure hope there is), they don’t allow for forwarding to the bereaved descendants. The stakes were high. 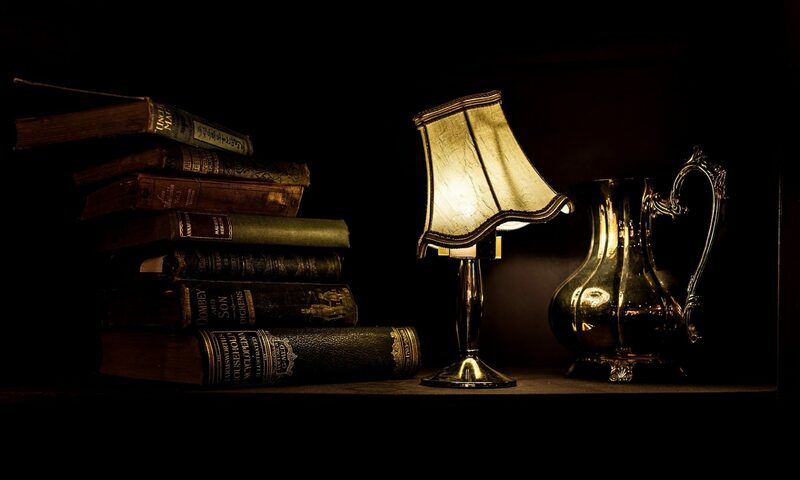 I gathered my materials from the various locations to which a state of partial unpackedness had spread them. Darning flat: no egg required. 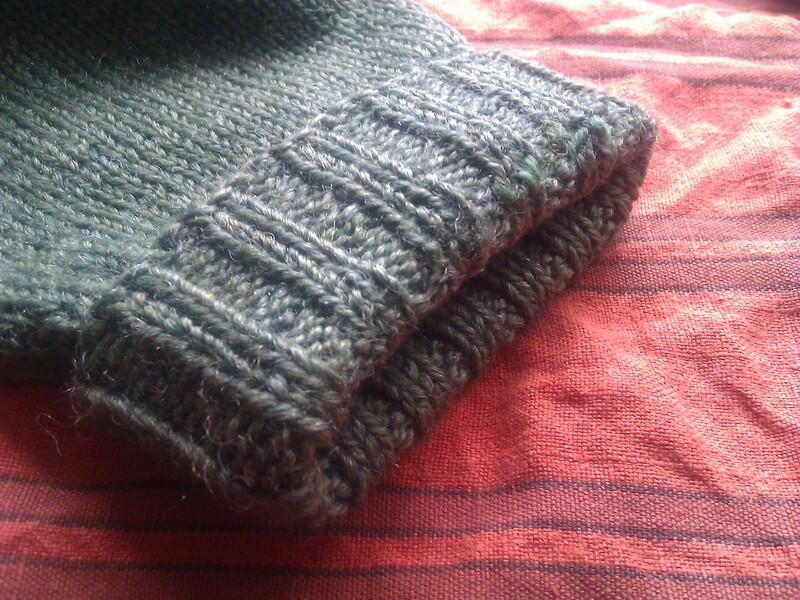 The actual darning wasn’t too much trouble, once I’d figured out a way to weave the needle in which didn’t leave long strands on the wrong side – or right side, if the cuff is folded back, though I doubt there is a right side for long unattached strands. There was more to do than I’d realized, however: the hole was small, but the eight-ply-worn-almost-to-lace section ran about halfway round the cuff. It took a while. The problem with darning, as identified by Miss Mary Grant, is that it is not exactly mentally invigorating – but it does require you to keep your eyes on what you are doing. Happily, however, ears are not a necessary part of the darning equipage, and you can listen to music, download an audiobook from Librivox, or, like me, get your nearest and dearest to read aloud to you while you work. It tends to take longer than you think. Just when you reach the end of the patch with your up-and-downs, you realize now you have to do all the back-and-forths (or vice versa). At least the camera’s odd rendition of colour makes the mend easier to see. But at last it is finished. 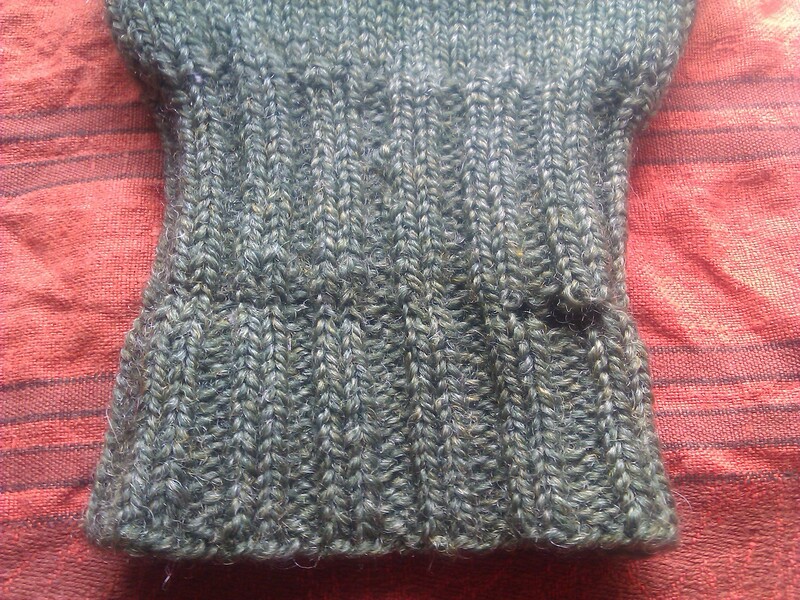 I am happy to say that the sleeve was saved: the darning not only captured any thread that was thinking of unravelling, but reinforced the whole worn area. It’s thick and sturdy now, I think it will survive. Wikipedia describes the guernsey as “a particularly hardy item of clothing” and notes that “It is not uncommon for a guernsey to last several decades and be passed down in families.” I don’t know if my guernsey will last that long (though it is well into its second decade now), but I intend to give it every opportunity to do so. Who knows? Maybe one day I will even have the guts to try Swiss darning. It’s certainly more beautiful than plain darning. 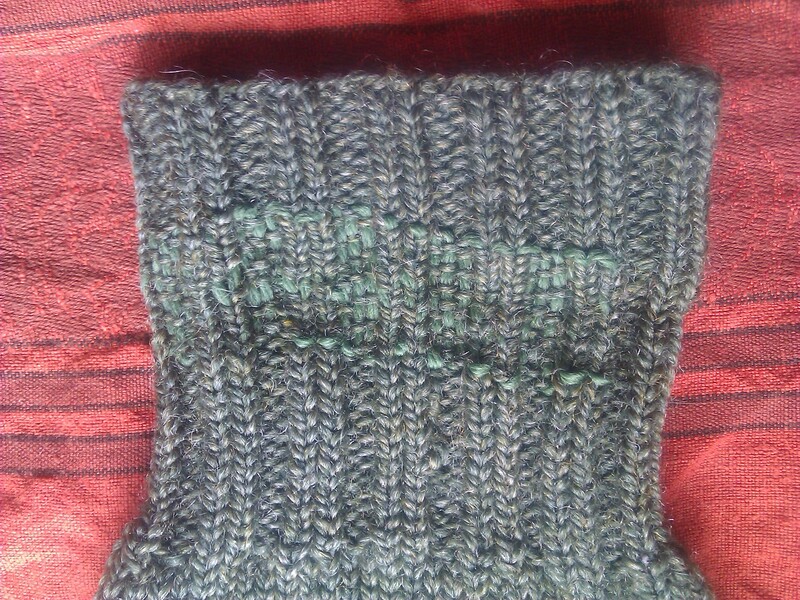 Still, while my mend may not be pretty, it’s practical, and that’s what guernseys are all about. 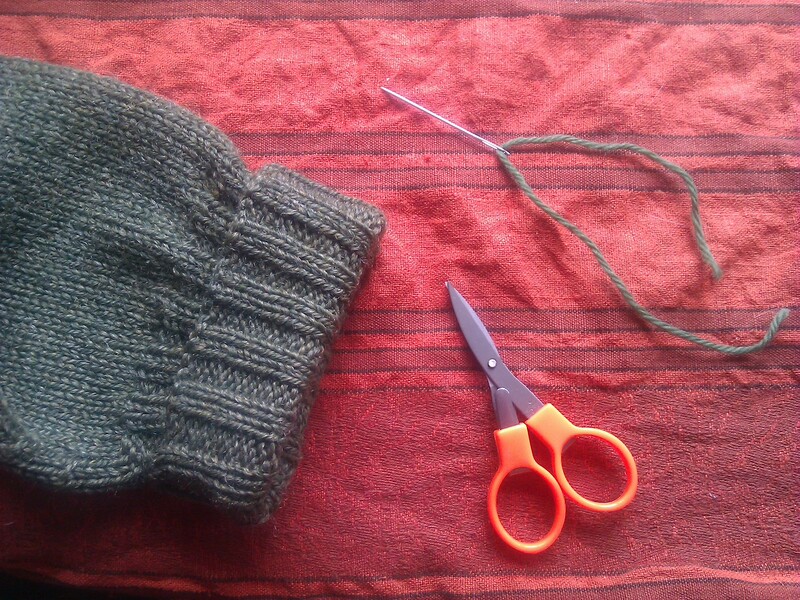 And I am glad that my practical skills can keep the guernsey together while it keeps me warm. Today’s bit of Old-Fashioned wisdom is brought to you by the guernsey: Keep Warm and Carry On. Oh how friendly your Guernsey looks. If my matching one ever comes adrift I shall send it up for repairs.